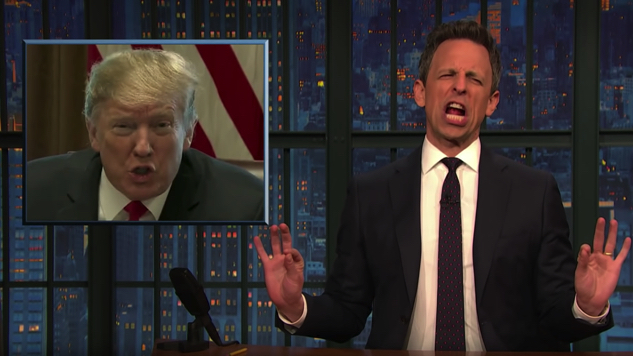 If you opted to maintain your sanity by skipping the State of the Union address on Tuesday night, you’re in luck: Late Night host Seth Meyers watched our big president blather so none of us would have to, recapping the SOTU speech in his latest “A Closer Look” while peppering in the ample, incisive mockery that Donald Trump’s clown show deserved. Meyers begins by setting up the context surrounding the speech, which of course was pushed back a week due to the government shutdown-shaped bullet a wall-obsessed Trump buried in his own orange foot. The Late Night host reminds his audience of the ongoing border wall battle and Trump’s recent asinine statements about same, in case you hadn’t realized the inherent absurdity of this SOTU speech’s central theme: unity achieved via bipartisan compromise. House Speaker Nancy Pelosi, as Trump weakly laments in an interview Meyers excerpts, has remained “rigid” on the wall, an expensive and ineffective solution to a wildly exaggerated problem, and one that the majority of Americans see through, at that. As a result, “the specter of a second government shutdown [loomed] over the whole affair,” as Meyers points out, establishing the stakes of the Trump/Pelosi showdown. Pelosi’s very presence at the address shifted the balance of power, breaking up the Mike Pence/Paul Ryan pep rallies that had played out behind Trump during previous SOTUs, with both grown men “standing and cheering for everything [Trump] said like Southern pageant moms” (“Yasss, Kaley, you are serving looks tonight!” Meyers cries). In wrapping up his segment, Meyers points out, “We’ve been here many times before; we all know the real Trump is the one who will reappear on Twitter tomorrow.” Oddly enough, as of this writing, the Wall Lover has not yet logged on and done so. Give it time, though: Before you know it, he’ll be claiming that Pelosi clap was a sincere endorsement of his “tremendous” long-form word salad. And he’ll probably believe it, too. Watch Meyers’ “Closer Look” below, enjoy the funniest tweets from last night here and take in Paste’s Jacob Weindling’s take on the SOTU here.